The Defense Department announced Friday that it has accounted for the first of more than two dozen black aviators known as Tuskegee Airman who went missing in action during World War II. Capt. 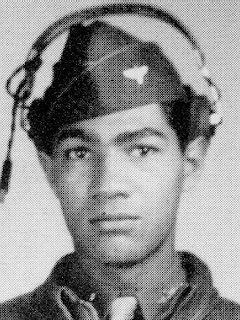 Lawrence Dickson, a fighter pilot who had trained at the Tuskegee Army Flying School, was 24 when he went down over Austria on Dec. 23, 1944, while on a mission. The Defense POW/MIA Accounting Agency (DPAA) had been investigating the possibility that human remains and other items found at a crash site in Austria this past summer were Dickson's. On Friday morning, the DPAA informed his daughter, Marla Andrews, 76, of East Orange, New Jersey, that the remains were those of her father. "I feel great!" she said in a telephone interview. "I really do feel a relief . . . I had a good crying jag." Dickson is probably the first missing Tuskegee Airman found since the end of World War II, the DPAA has said. The heroic pilot was among the more than 900 black pilots who were trained at the segregated Tuskegee Army Air Field in Alabama during the war. There were 27 Tuskegee Airmen missing from the war. Now there are 26.